The government of Iraq has started its own YouTube channel in an attempt to show the world what the administration is trying to accomplish in the war-torn country. 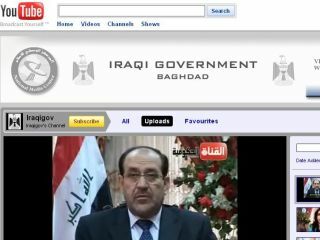 The Iraqi government – led by Prime Minister Nuri al-Maliki – is keen to show that technology is an important part in rebuilding the nation, and has launched the YouTube channel at http://www.youtube.com/iraqigov. "The Internet presents all of us with the biggest communications opportunity of our time," said Iraqi Prime Minister Nuri al-Maliki. "Through the Iraqi Government YouTube channel we will publicize important services and programs, share news, give progress updates, engage with people both at home and abroad on important issues and showcase potential investment opportunities." The channel will serve two purposes – allowing the government to display speeches, informal chats and behind-the-scenes footage but also acting as an archive for future generations. "New media tools like YouTubehelp provide a level of access and transparency that has never been possible before in government," said Eric Schmidt, CEO of Google. "It is exciting to see the Iraqi Government embrace online video as a new way to connect and engage with the Iraqi people and citizens of the Web around the world."